Click (or tap) the icon of a report whose name begins with "Analysis" and ends with "Report Builder" (to create a report from scratch). 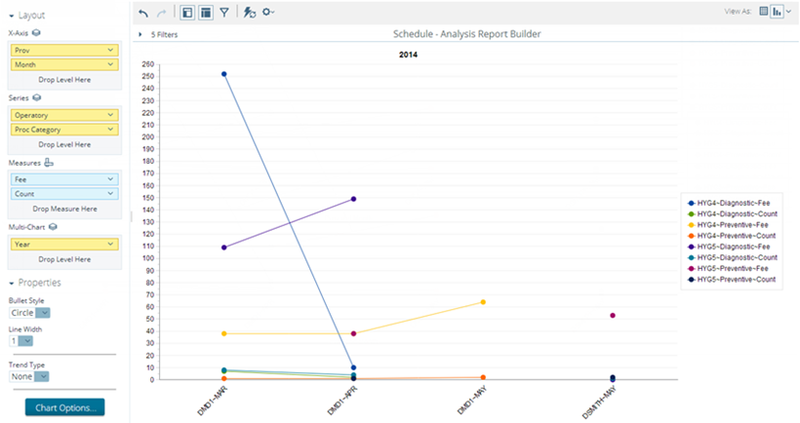 Or, click (or tap) a saved report (for only you or for all users) that was based on an analysis report builder. 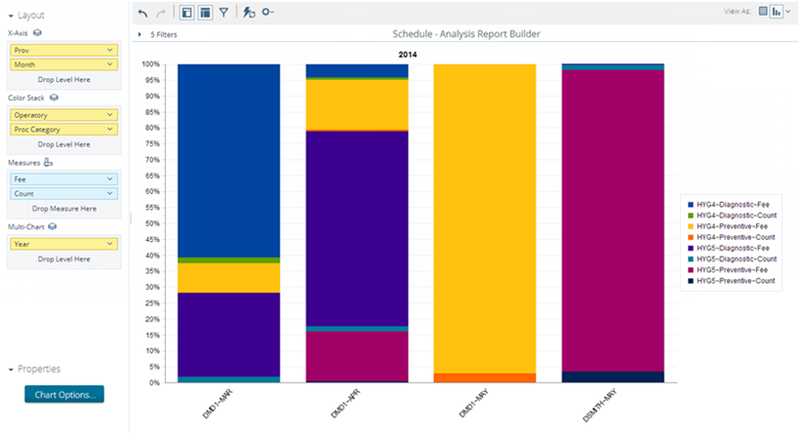 The analysis report builder options for that report appear. Available fields list - Depending on the type of analysis report (for example, schedule), the items (data fields) that appear in the Available fields list may vary. The data fields in the list correspond to information in your organization's database. The data fields are grouped by category. There are two types of data fields: standard and measurable (only in the Measures category). Layout panel - The Layout panel displays data fields that you have dragged from the Available fields list. Toolbar - You can perform various tasks (such as controlling the layout of the page and report layout format, changing report options, resetting or clearing the report, and exporting the report) from the toolbar. Example: A custom report that displays the revenue for and the number of procedures from scheduled appointments, broken down by the specified operatories and procedure categories, for the specified providers within the specified year and months. 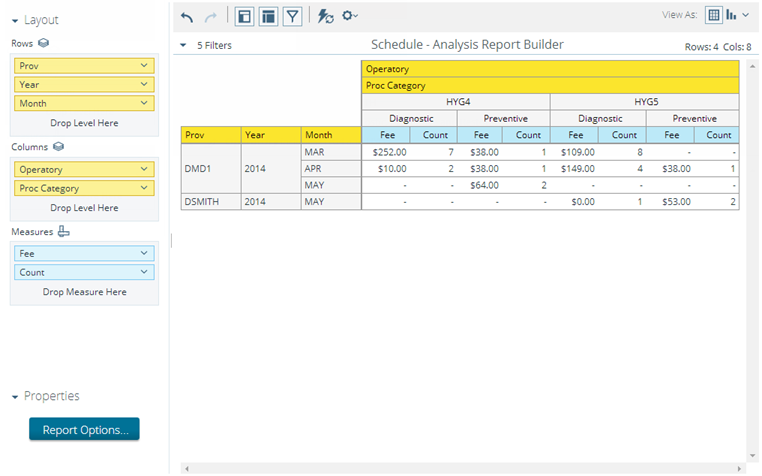 To create the layout of the report, drag data fields from the Available fields list to the boxes on the Layout panel. Measures - Creates a column for a measurable data field. For example, adding the Fee and Count data fields creates two columns. Rows - Creates a column with a row for each item associated with a data field. For example, adding the Prov, Year, and Month data fields creates a Prov column with rows for each provider ID (such as DMD1 and DSMITH), a Year column with rows for each year, and a Month column with rows for each month. The measures (Fee and Count) for each combination of provider ID, year, and month are calculated automatically. Columns - Breaks down a measure into multiple columns. For example, adding Operatory and Proc Category data fields creates columns for each operatory (such as HYG4 and HYG5). Each of those columns contains columns for each procedure category (such as Diagnostic and Preventive). Each of those columns contains measure columns (Fee and Count). The measures for each combination of operatory and procedure category are calulated automatically for each row. Measures - Creates a bar for a measurable data field. For example, adding Fee and Count data fields, creates two bars. X-axis - Creates columns on the X-axis for each item associated with a data field. Each column displays the measure bars. For example, adding Prov and Month data fields creates columns for each combination of provider ID and month (such as DMD1~MAR, DMD1~APR, DMD1~MAY, and DSMITH~MAY). Each column has Fee and Count measure bars. Series - (For regular only) Breaks down a measure bar into multiple bars. For example, adding Operatory and Proc Category data fields splits the Fee bar into bars for each combination of operatory and procedure category (such as HYG4~Diagnostic~Fee, HYG4~Preventive~Fee, HYG5~Diagnostic~Fee, and HYG5~Preventive~Fee). Color Stack - (For stacked and 100% stacked only) Breaks down a measure segment on a bar into multiple segments. For example, adding Operatory and Procedure Category data fields splits the Fee segment on each bar into segments for each combination of operatory and procedure category (such as HYG4~Diagnostic~Fee, HYG4~Preventive~Fee, HYG5~Diagnostic~Fee, and HYG5~Preventive~Fee). Multi-chart - Creates multiple charts for each item associated with a data field. 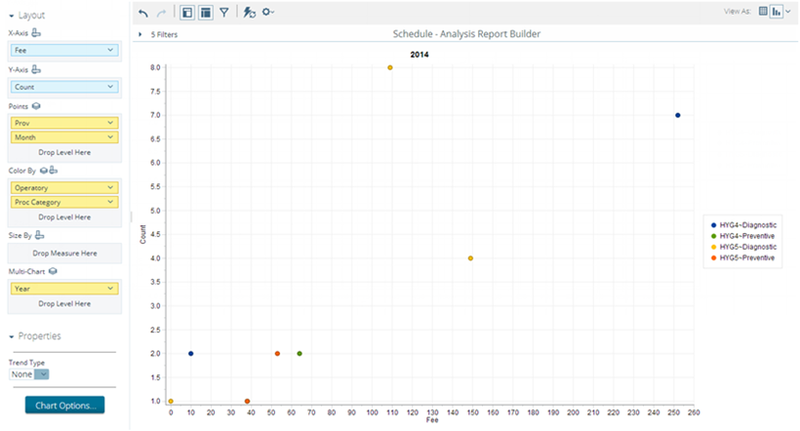 For example, adding the Year data field creates charts for each year. Measures - Column - Creates a bar for a measurable data field. For example,adding the Fee data field creates a bar. Measures - Line - Creates a line for a measurable data field. For example,adding the Count data field creates a line. X-axis - Creates columns on the X-axis for each item associated with a data field. Each column displays the measure bars and lines. For example, adding Prov and Month data fields creates columns for each combination of provider ID and month (such as DMD1~MAR, DMD1~APR, DMD1~MAY, and DSMITH~MAY). Each column has Fee measure bars and Count measure lines. Series - Breaks down a measure bar into multiple bars. For example, adding Operatory and Proc Category data fields splits the Fee bar into bars for each combination of operatory and procedure category (such as HYG4~Diagnostic~Fee, HYG4~Preventive~Fee, HYG5~Diagnostic~Fee, and HYG5~Preventive~Fee). Measures - Creates a bar for a measurable data field. For example,adding Fee and Count data field creates two bars. Y-axis - Creates rows on the Y-axis for each item associated with a data field. Each row displays the measure bars. For example, adding Prov and Month data fields creates rows for each combination of provider ID and month (such as DMD1~MAR, DMD1~APR, DMD1~MAY, and DSMITH~MAY). Each row has Fee and Count measure bars. Color Stack - (For stacked and 100% stacked only) Breaks down a measure segment on a bar into multiple segments. For example, adding Operatory and Proc Category data fields splits the Fee segment on each bar into segments for each combination of operatory and procedure category (such as HYG4~Diagnostic~Fee, HYG4~Preventive~Fee, HYG5~Diagnostic~Fee, and HYG5~Preventive~Fee). X-axis - Creates columns on the X-axis for each item associated with a data field. 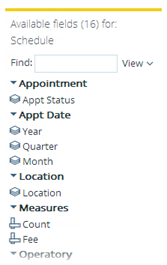 For example, adding Prov and Month data fields creates columns for each combination of provider ID and month (such as DMD1~MAR, DMD1~APR, DSMITH~MAY, and DSMITH~MAY). Also, in this example, the month columns for any given provider are a column group. Measures - Creates entries on the Y-axis for a measurable data field. A point for a measure appears in each column. The points in a column group are joined by lines. For example, adding Fee and Count data fields creates points in each column on the X-axis. The points in each column group (all the month columns for a provider) are joined by lines. Series - Breaks down a measure line into multiple lines. For example, adding Operatory and Proc Category data fields splits the Fee line into lines for each combination of operatory and procedure category (such as HYG4~Diagnostic~Fee, HYG4~Preventive~Fee, HYG5~Diagnostic~Fee, and HYG5~Preventive~Fee). Measures - Creates a pie chart for a measurable data field. For example, adding Fee and Count data fields creates two pie charts. Slices - Creates slices in a pie chart for each item associated with a data field. For example, adding Prov and Month data fields creates slices in the Fee pie chart for each combination of provider and month (such as DMD1~JAN, DMD1~FEB, DSMITH~JAN, and DSMITH~FEB). Multi-pie - Breaks down a measure pie chart into multiple pie charts. For example, adding Operatory and Proc Category data fields splits the Fee pie chart into pie charts for each combination of operatory and procedure category (such as HYG4~Diagnostic~Fee, HYG4~Preventive~Fee, HYG5~Diagnostic~Fee, and HYG5~Preventive~Fee). X-axis - Creates entries on the X-axis for each item associated with a data field. For example, adding Prov and Month data fields creates entries for each combination of provider ID and month (such as DMD1~MAR, DMD1~APR, DSMITH~MAY, and DSMITH~MAY). Measures - Creates entries on the Y-axis for a measurable data field. The shape and size of an area is determined by the measure on the Y-axis and the entries on the X-axis. For example, adding Fee and Count data fields creates two areas. Series - Breaks down a measure area into multiple areas. For example, adding Operatory and Proc Category data fields splits the Fee area into areas for each combination of operatory and procedure category (such as HYG4~Diagnostic~Fee, HYG4~Preventive~Fee, HYG5~Diagnostic~Fee, and HYG5~Preventive~Fee). X-axis - Creates entries on the X-axis for a measurable data field (for example, Fee). Y-axis - Creates entries on the Y-axis for a measurable data field (for example, Count). Points - Adds dots where the X and Y values for the data fields intersect. For example, adding Operatory and Procedure Category data fields adds dots for each combination of operatory and procedure category, such as HYG4 & Diagnostic, HYG4 & Preventive, HYG5 & Diagnostic, and HYG5 & Preventive). 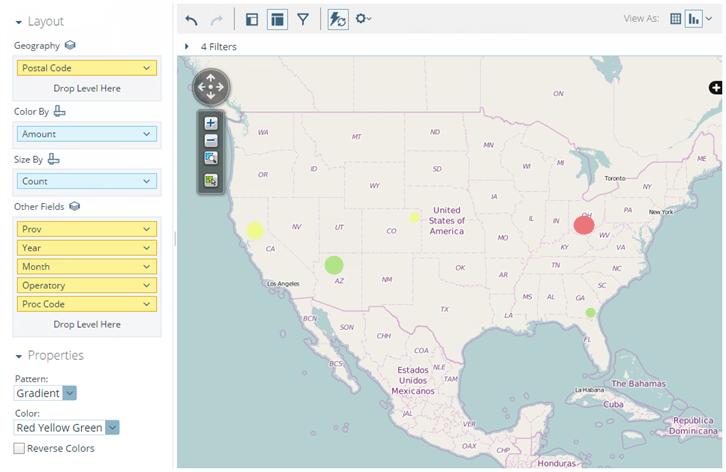 Color By - Breaks down a dot into multiple dots according to a data field. You must use a data field (standard or measurable) that is not already being used for the layout. For example, adding the Provider data field splits a dot into dots for each provider. Size By - Changes the size of the dots according to a measurable data field. You must use a measurable data field that is not already being used for the layout. X-axis - Creates columns and sub-columns on the X-axis for each item associated with a data field. 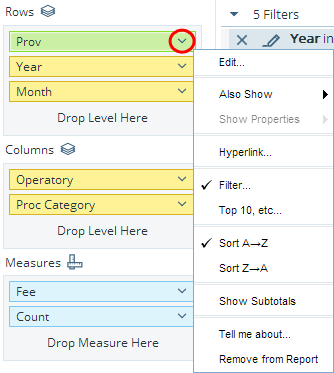 For example, adding Prov and Month data fields creates columns for the months (such as MAR and APR) within the columns for the providers (such as DMD1 and DSMITH). Y-axis - Creates rows and sub-rows on the Y-axis for each item associated with a data field. 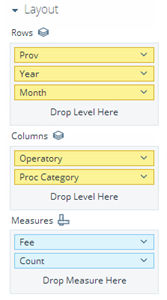 For example, adding Operatory and Procedure Category data fields creates rows for the procedure categories (such as Preventive and Diagnostic) within the rows for the operatories (such as HYG4 and HYG5). Color By - Colors the boxes, across the gamut of warmer to colder colors, according to a measurable data field (for example, Fee). Size By - Sizes the boxes, from smaller to larger, according to a measurable data field (for example, Count). Geography - Identifies the regions where areas may appear. Color By - Colors the areas, using the selected Pattern and Color, according to a measurable data field (for example, Amount). Size By - Sizes the area, from smaller to larger, according to a measurable data field (for example, Count). Other Fields - Creates areas for each item associated with a data field. 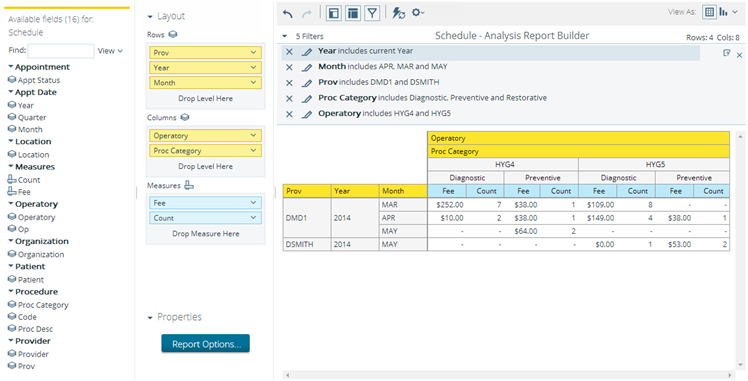 For example, adding Prov, Month, Operatory, and Procedure Category data fields creates areas for procedures pertaining to procedure categories (such as Preventive and Diagnostic) that were performed in specific operatories (such as HYG4 and HYG5), by specific providers (such as DMD1 and DSMITH), during specific months (such as MAR and APR). 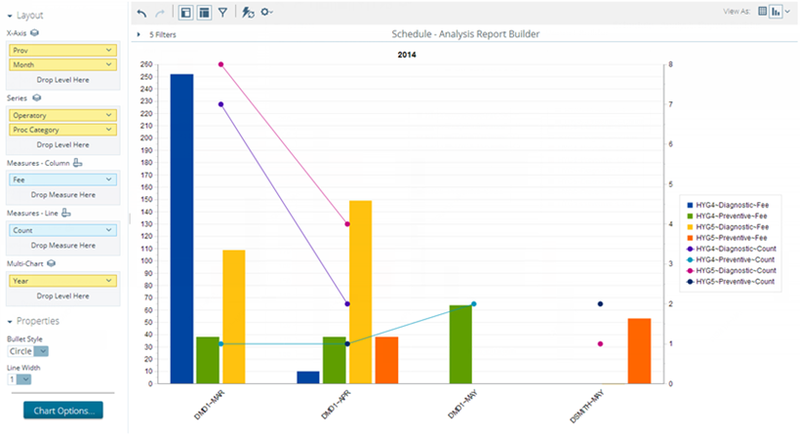 Filter the report, change the report format, and perform other tasks as needed. Drag a data field (does not have to be part of the layout already) from the Available fields list to the Filters box. From the menu for a data field that is part of the layout already, click (or tap) Filter. Match a specific string - Select Contains or Doesn't Contain from the list to specify that you want to filter the report to include items on the report that contain or do not contain what you type in the field. Click (or tap) the Add another value link to add other text. Repeat as needed. Choose a commonly used time period - Select Current Year, Previous Year, Next Year, Previous [number of] Year (type a number), Next [number of] Year (type a number), [Number of] Year ago (type a number), and/or [Number of] Year ahead (type a number) to specify the time period for the report. Select a range - Select whether the range is Between, After, or Before the selected time period, inclusive. Greater/Less Than, Equal to, etc. - Select one of the measures and specify the condition that has to be met (for example, greater than 100). Top 10, etc. - Select whether you want the Top or Bottom results, type the number of results to include, and select a measure. Change format - To view the report in one of the various formats (for example, as a table, a bar graph, or a pie chart), next to View As, click (or tap) the Switch to Table Format button , or select the desired format from the Switch to Chart Format button menu. Hide list of available fields / Add more fields onto the report button . Hide layout panel / Rearrange fields on the report button . Hide filters / Show all filters in use and add new filters button . To export the report to save or print it, on the More actions and options button menu, point to (or tap) Export, and then click (or tap) the desired output file format (for example, To PDF). This feature is currently only available for our beta customers. You must not be one of those. Sorry. I'm not sure when this feature will be made generally available.